The Pope commented on Christ´s words, saying that "prayer is not a magical thing, there is no magic with prayer." “Someone once told me that when he went to a "witch doctor" they said a lot of words to heal him. But that is pagan,” Pope Francis said. “Jesus teaches us that we should not turn to Him with so many words because He knows everything. The first word is ‘Father’, this is the key of prayer. Without saying, without feeling, that word you cannot pray". 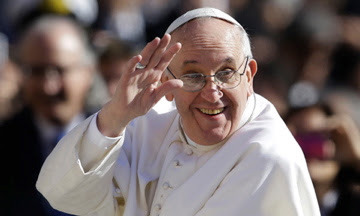 "Father is a strong word but it opens the door,” the Pope stressed. “At the time of sacrifice, Isaac realized that something was wrong because he was missing a sheep, but he trusted his father and confided his worries to his father’s heart. Concluding his homily, the Holy Father stated that Our Father is a calling for the faithful to forgive others as God forgives us our sins. While acknowledging the difficulty in forgiving one's enemies, Pope Francis said that Christ, through the Holy Spirit, gives us the strength from the heart. “Today,” the Pope concluded, “we ask the Holy Spirit to teach us to say 'Father' and to be able to say 'our', and thus make peace with all our enemies."